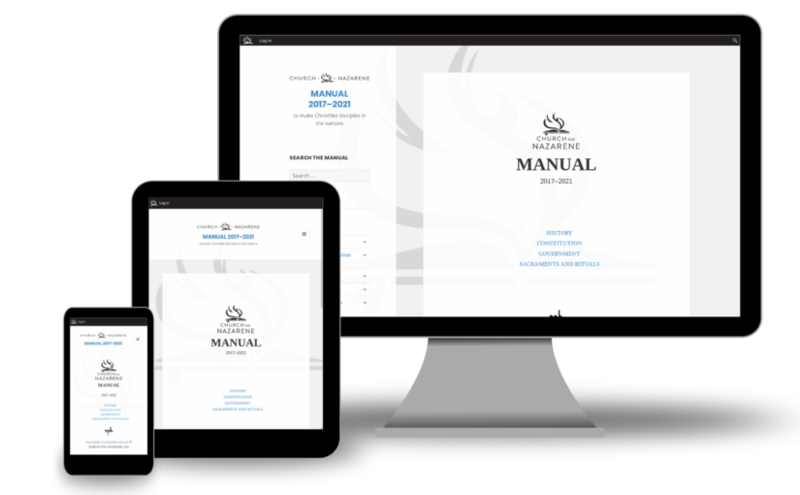 The new electronic version of the 2017–2021 Manual of the Church of the Nazarene is designed to be easy to use on any size screen. Whether you have a particular paragraph number in mind or you don’t know where to begin to look, we’ve developed several tools to help you find your way around. Use the arrows below to learn more about the electronic version of the Manual. If you need more assistance, then please contact us. The electronic version of the Manual is filled with links already. Links to other parts of the Manual appear in blue. External links to other websites also appear in blue and are followed by an arrow icon (see the example below from the Foreword). Whether you want to share a paragraph from the Manual with a friend or to save a section for yourself for later reference, the link structure makes it easy to cite exactly which part of the Manual you want to read. You can copy and paste any link on any page. The links for each piece of the electronic version of the Manual also follow a similar pattern. This pattern appears in the address bar for most browsers. NOTE: This is only an example; there is no page with the content type, CONTENT_TYPE, or with the slug, SLUG. After the content type there are two forms for the slug, or the part of the link that names a specific item within a specific content type. Slugs for the section, front matter, and back matter content types all appear as lowercase words separated by hyphens (-). Depending on the paragraph, slugs match the numbers assigned to them. Top-level paragraph numbers are preceded by the letter p. Sub-paragraphs are preceded by the slug for their parent paragraph, then a forward slash (/), then the letter s.
Like the thumb index for the print version, the table of contents for the electronic version puts the major sections of the Manual at your fingertips. On smaller screens, you can open the table of contents with the ☰ icon near the logo at the top. By default, only the major headings for parts and series are visible. 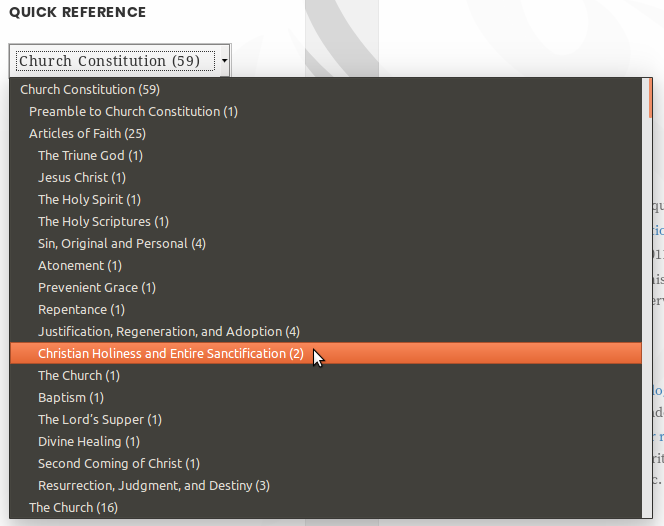 NOTE: Only the sections that traditionally appear in the printed table of contents appear here in the electronic version. For a complete list of sections, please see the Quick Reference. Search forms appear above and below the table of contents. So at least one is always within reach. In the top corner on larger screens, you can also access a search form with the magnifying glass icon. Like most search engines, you can search for individual words or phrases. You can also use quotation marks (“ ”). 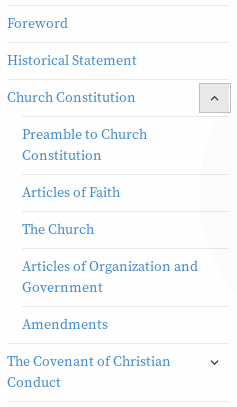 For example, Board of General Superintendents combines searches for each term, board, general, and superintendents; but “Board of General Superintendents” matches the exact phase, Board of General Superintendents.